Leave Douglas centre via Avondale Road towards Signpost Corner and continue onto Hillberry Road. After passing Birch Hill Crescent on the right hand side turn left into Lhon Vane Close which leads directly into Lhon Dhoo Close and the property is along on the left clearly identified by our “For Sale” board. uPVC double glazed porch entrance with mahogany effect uPVC double glazed front door and uPVC glazed inner door. Coal effect electric fire with attractive fireplace. Large understairs cupboard. Fitted with a range of light wood effect base, wall and drawer units. Matching work surfaces with tiling behind and inset 1½ bowl single drainer stainless steel sink unit. Electric oven and gas hob with extractor hood above. Plumbing for automatic washing machine. Vaillant gas fired combination boiler. Stairs to the first floor. Door leading to the rear garden. L-shaped room with fitted wardrobes. Fully tiled to compliment a modern white suite comprising p-shaped bath with plumbed in shower over, vanity wash hand basin and toilet. Tiled floor. Towel rail/radiator. Plus eaves and less the stair opening. Concrete driveway to the front of the property with space for 2 cars and lawned frontage. Lawned rear garden with Shed. Mains water, electricity and drainage. Oil fired central heating with a recently replaced storage tank. 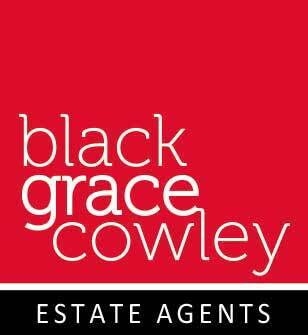 Strictly by appointment through the Agent, Black Grace Cowley.